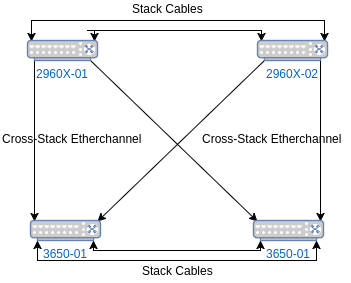 This tutorial will demonstrate how to get a pair of Cisco 2960X switches up and running as a stack with stackwise. 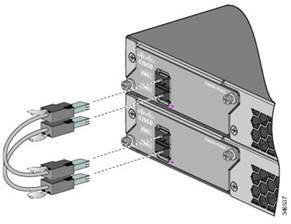 A single stackwise connection with the 2960-X equates to 20gbps (full duplex) - although with the additional stack connection we get 40gbps - this can go up to 80gbps with additional stack members. The switch that you are currently consoled into is marked with an asterisk - so in my case I on the master switch. There are a number of rules (for example: existing master of stack, hardware / software priorities) that define how the stack master election is performed - although in our case it is simply due to the fact that one of the switches had a greater up-time than the other. Please refer to the sources / further reading section for a more detailed explanation. It's never a bad idea to configure a backup-master switch in the stack - by default the a new switch in the stack is assigned a priority of 1 - so in my case since I've not modified these values both of them are currently set to 1. The priority level can be between 1 and 15 - with the greater value taking precedence - for example I will set my master switch to 14 and the secondary to 13. 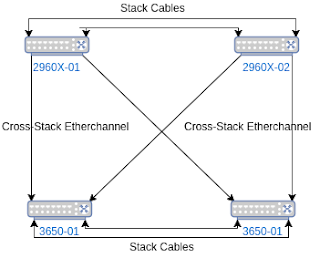 Although this is strictly not necessary in a two-node stack - but would come in handy in the event that we add an additional switch into the stack at a later date. With the 2960X switches you can easily add an additional switch into the stack - even when it's already powered on - although when plugged in the new switch will automatically reboot itself to clear the configuration etc. * Note to perform the above the image must be a tar ball! During this process the master node is tasked with ensuring that every other switch in the stack is upgraded successfully. and then simply type exit to go back to the master switch again.